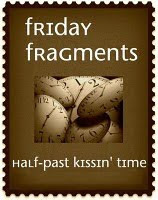 Mrs. 4444 is our host for Friday Fragments. ***Casi Cielo is back! This is my absolute favorite coffee in the world. ***I realized this week that my verbal editing skills have suffered as a result of being able to backspace and delete so often. Not that they were that great anyway. Oh, and my handwriting? Pathetic! ***Last weekend, I saw Expressing Motherhood, and was utterly moved by the show. I wrote about it for Examiner. ***I left work early on Tuesday to take the girls to get their glasses fixed (yes, both of them!) and we ended up getting home before 5. It was incredible the difference that made! We didn't feel rushed, the girls got their homework done, it was good. ***Last weekend, the girls came with me to DreamDinners and really enjoyed it. I think next time, Sylvia can make some meals solo and Riley can help me, and it will be a nice family outing for all of us. ***Our department had our holiday dinner last night because we couldn't get everyone together before the holidays. It ended up being even nicer since none of us were concerned with all that had to be done. And I got the best gift! My Secret Santa took the holiday photo that I'd sent and made a coffee cup out of it. AND the coffee cup holds nearly twice as much as your average cup. ***I already said this in a comment on someone else's post, but I find it really interesting that as much as people roll their eyes when talking about social media, the mainstream media had no problem showing tweets and youtube videos when they couldn't get into Haiti earlier this week. ***Remember about 3 ***'s ago when I said I got both the girls' glasses fixed? Riley's are broken again. ***And with that, we head into a long weekend. Yay! That's awful about the glasses! I can imagine how hard it would be to keep from breaking glasses when you're a kid. Is it bad that I've been purposely avoiding getting Shiloh's eyes checked? I wore glasses as a child and so did my ex (I've had laser eye surgery as an adult) so I'm afraid Shiloh will need them too. And I'm not ready to deal with it yet. I wonder what age they start testing for that anyway? Nothin better than a BIG coffee cup to hold your daily caffiene! Have a great weekend April. In relationship to the verbal editing thing- I've completely lost the ability to spell. Between Firefox's automatic spell check and trying to learn another language I just think that I'm doomed! That Dream Dinners looks like it's really great. I don't think we've got anything like that here. I've found that leaving just 10 minutes early can make a world of difference in my ability to decompress after work. Oooh, that coffee looks good. Coming by from Friday Frags... yeah, I know, I'm 5 days late, but you said in your most recent post that you understand not having any time during the week... so I hope you'll forgive me! I LOVE coffee cups that are twice as big as normal. I have a ton of them in my house, and that's all we use! It's Thursday night, and I'm giddy; what can I say? !